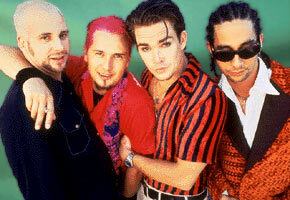 Sugar Ray Biography, Discography, Music News on 100 XR - The Net's #1 Rock Station!!! Sugar Ray was first formed in 1992 in Newport Beach, California USA, as a four-piece Funk-Metal project by lead singer Mark McGrath, guitarist Rodney Sheppard, bassist Murphy Karges and drummer Stan Frazier; the band had built a fanbase by touring constantly around Los Angeles area and they eventually snagged a deal with Atlantic Records in 1994. DJ Craig 'DJ Homicide' Bullock was added to the line-up before the group released its debut album, "Lemonade & Brownies", in the spring of 1995. Two years later they returned with "Floored" that showcased a more Alternative-Rock style; this album reached the #12 position on The Billboard 200 and cracked the top 10 in Canada selling over 2 million copies while the lead single, "Fly", hit #1 on The Modern Rock chart; the follow-up single "RPM", grabbed a #35 spot on the same chart. 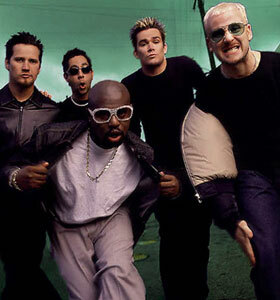 The third release from the Southern California unit, "14:59", arrived in January of 1999 reaching #17 in U.S. and spawning three smash singles, "Every Morning" hit #1 slots on both Billboard's Modern Rock and Adult Top 40 charts and peaked at #3 on The Billboard Hot 100 becoming a sizeable hit across Europe; "Someday" reached the #7 spots on both The Billboard Hot 100 and The Modern Rock charts; the final single, "Falls Apart", climbed into the top 5 of The Modern Rock Tracks sending "14:59" into triple-platinum territory. Sugar Ray followed it up with an eponymously titled effort in June 2001, the set rose to #6 on The Billboard 200 Albums list led by the single "When It's Over" which peaked at #13 on The Billboard Hot 100; the album also included the Adult Top 40 hit "Answer The Phone". "In The Pursuit Of Leisure" was issued two years later, it debuted at #29 on the U.S. Top Albums chart and generated three single cuts: "Chasin' You Around", "Mr. Bartender (It's So Easy)", supported by a video and the cover of Joe Jackson's "Is She Really Going Out With Him? ", the latter two peaked at #20 and #19, respectively, on Billboard's Adult Top 40 chart. In 2005 the Orange County fivesome assembled a retrospective CD which featured 15 tracks including the Adult Contemporary top 40 single "Shot Of Laughter". Sugar Ray issued its first full album of new material in more than six years when "Music For Cougars" came out in July 2009. The first single, "Boardwalk", was an instantly recognizable summer tune but failed to make any impact on the airplay charts.